This program is definitely a sea-kayaking trip. 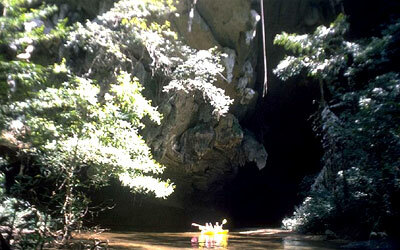 Most days, we are able to start the trip from either Phuket or Krabi and get to the far south of Thailand. There, we'll see the mangrove swamps and virgin forests, with local natural ponds and rare floral and bird species at Khao Pra-Bang Khram, a no-hunting zone in Krabi. We will also visit Chao Mai marine national park at Trang, the largest waterfowl reserve in Thailand at Phatthalung, and an old native tribe called Sakai at Satun. 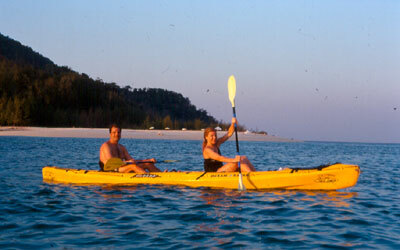 You are on fresh or salt water for a typically stunning and unique SeaCanoe paddling experience. You might paddle through a mountain, explore coastal islands with caves, Hong and rock gardens, enjoy wildlife observations, swim in hot springs, and have a great time playing "Local" with your new Thai friends. But most of all, this adventure is a fun and interesting insight into the culture and nature of South Thailand with the folks who know and live it - your SeaCanoe staff. 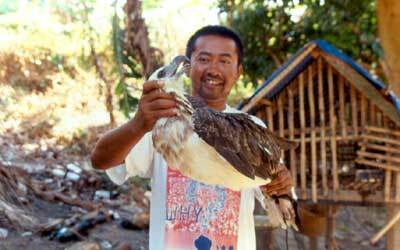 Depending upon group size, you might travel in a 4x4 pick-up or traditional Thai "Songtaew" bus. 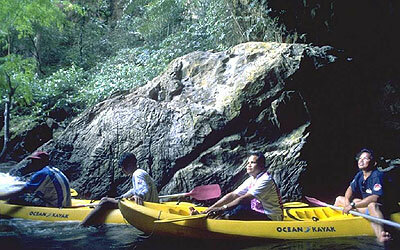 Day 1: Pick up from your Phuket Hotel, Phuket airport or Krabi hotel. Arrive at Lonely Monk Mountain temple. Full group transfer to Petroglyph Caves. Lunch at over-water restaurant. 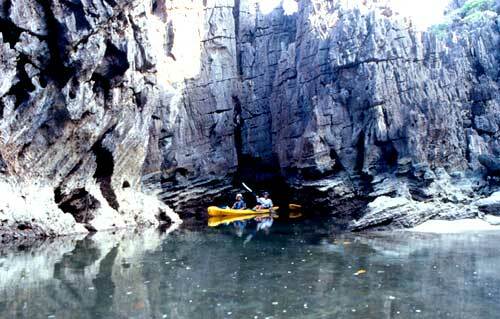 Paddle mangroves, sea arches and caves, Hongs and see petroglyphs. Take out and transfer to temple for a visit. Dinner catered by SeaCanoe. Day 2: Breakfast and break camp. 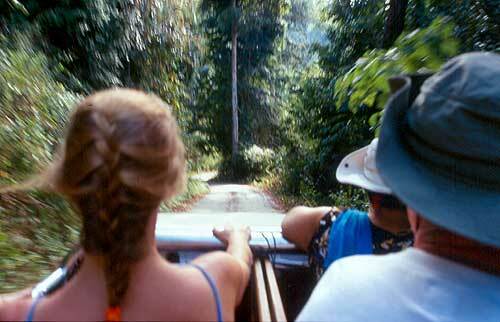 Travel to Hot springs for bathing & jungle trekking with swimming in the natural pool. Lunch is at selected restaurant. Arrive at beach camp. Make camp. Sunset paddle under limestone cliffs. 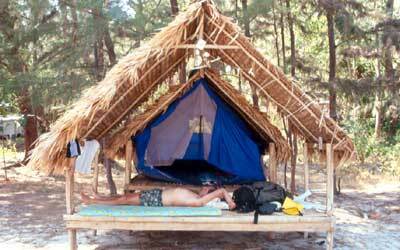 Day 3: Depart for mangrove and Hong paddle. Seafood lunch in restaurant. Arrive at waterfall in National Park and make camp. 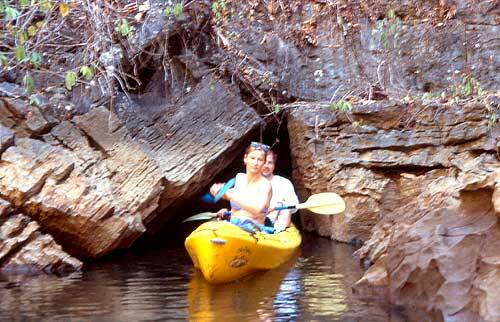 Day 4: Paddle in fresh water - water river in two kilometer long cave. Picnic lunch downstream of cave followed by a sunset paddle. Day 5: Local style breakfast (Western back-up if necessary). Longtail transfer to rock gardens and triple-entrance Hong. Check-out of bungalows and seafood lunch. Arrive at staff family lands and make camp. 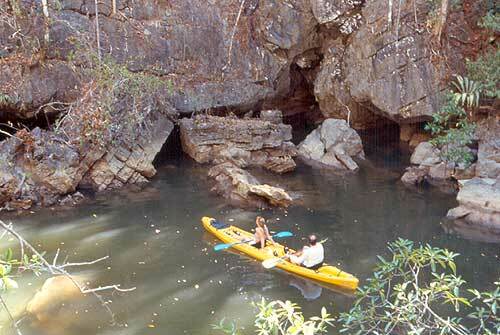 Sunset paddle below the cave - excellent eco-system! Dinner at selected restaurant and visit the relatives. Day 6: Camp breakfast. 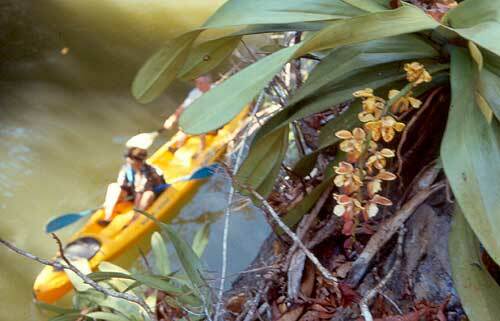 Paddle in mangrove swamp. Depart for Hat Yai. 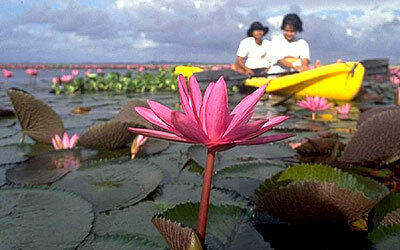 Arrive at Hat Yai airport and Hat Yai hotels. Please note: This information is offered to give you a general idea of our product and is not contractual. 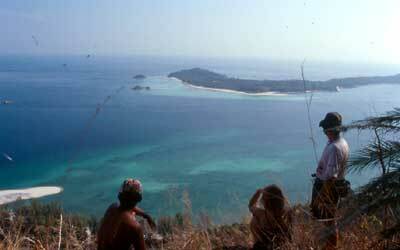 Times and locales often vary according to tides, weather, and the decisions of the expedition leader. Our objective is to give you the best possible experience within the time frame and detailed conditions of your expedition. Our policy is to continually update and improve our products for your benefit. You are Fully insured for public liability with The AIG Insurance.